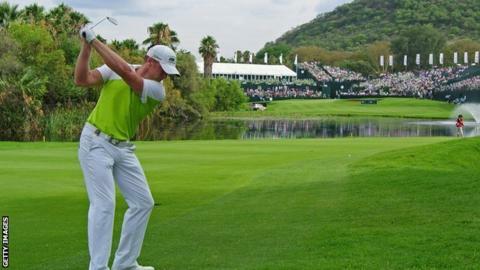 Welshman Jamie Donaldson carded a five-under 67 to maintain his lead after the third round of the Nedbank Golf Challenge in Sun City. The 38-year-old is three shots clear of Denmark's Thomas Bjorn (66) and American Ryan Moore (67) in the race for the $1.25m (£764,000) first prize. Donaldson said: "Every win is special, this would be just a bit more special." Spaniard Sergio Garcia shares fourth with Race to Dubai and FedEx Cup winner Henrik Stenson (69). Thailand's Thongchai Jaidee matched Garcia's 66 to join him and Stenson on 11-under at the South African tournament. Pontypridd-born Donaldson strung together six birdies and just one bogey on a low-scoring day when 13 players broke par. He enjoyed back-to-back birdies at the 4th and 5th holes, 10th and 11th, and at the 14th and 15th. Donaldson added: "I'm looking forward to the final round. It will be a tough day on a difficult golf course. And this is one of the best fields in the world. A three-shot lead doesn't mean much here. "I will continue to play as aggressive as I can. I have to, because somebody can come out and birdie the first three holes and I make par and suddenly there is no lead." But home favourite Ernie Els struggled to a 77 and a seven-over total after hearing of the death of his former coach Jos Vanstiphout. Els said it was "another very sad day" for him after the death of former South African President Nelson Mandela on Thursday.